How to get to El Nido in 2019? El Nido is a town, but also an area of Palawan island. It is renowned for its incredible landscapes, pristine white sand beaches, limestone cliffs on its 45 islands (which make up the archipelago of Bacuit), and its tropical forest which surrounds the old fisherman's village. The Filipino government officially made El Nido-Taytay a protected area in 1998. In 2006, the area was listed under UNESCO's heritage in the category "Nature". 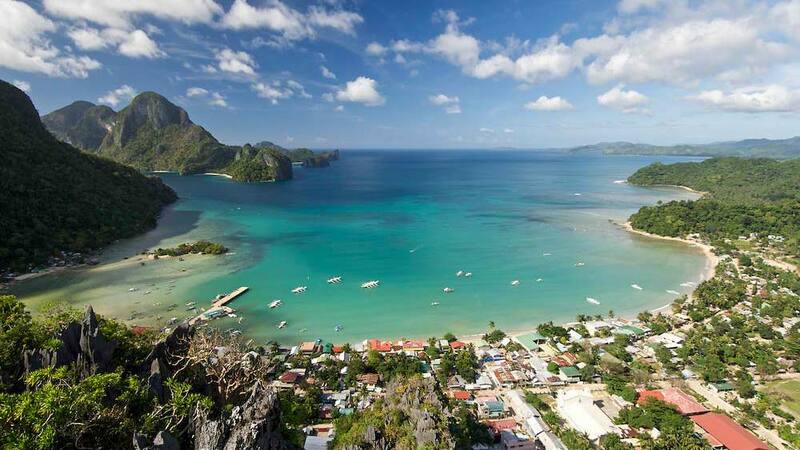 Since then, the region of El Nido builds up a fame which keeps increasing. The panoramas of the islands, the underwater flora and the fauna make this place one of the most various and spectacular on the planet. With all the conveyance listed here, as well as the description of the seasons in El Nido, you will be able to find your best way to reach El Nido town. We also give you below a few pieces of advice, and recent information got from the local office tourism (2019) which is useful to know before going. It is the most popular, but also the longest: you take a flight to Puerto Princesa, and then a van to El Nido. To fly to Puerto Princesa, you will have to choose first one of the domestic airlines such as the Philippine Airlines, PAL Express, Cebu Pacific, Tiger Airways or Air Asia. The flights cost US$70 for a round trip when you are lucky, but it can cost up to US$200. There are several flights a day, often late, so plan enough time: take 2 extra hours for your stopover on the way back to be sure. NB: Terminals 1, 2, and 3 in Manila are far away from each other. You can find taxis or free shuttles between them. Keep in mind that everything you do takes time. If you don’t already know: whatever you want to do in the Philippines takes time, but always with a smile (there is a saying: "It's Filipino time"). It is also possible to fly from other cities in the Philippines. Cebu is one of the main cities, and it has an international airport which is served by many airline companies. Have a look at the international flights. Also, price lists between Cebu and Puerto Princesa are generally cheaper than from Manila. There are indeed fewer passengers. For domestic flights, the aircraft used are often the reliable Airbus A320. There was a time when the 230 km route between Puerto Princesa and El Nido took 24 hours. It was a great adventure indeed! Since then, tourism made things happen: No more than 5 hours are needed today, and you can pretend to be in paradise. Life is beautiful, isn't it? The bitumen road has been completed since 2016. Once you arrived at the airport of Puerto Princesa, the capital of the province of Palawan, if you haven't booked your minibus yet to go to El Nido, it doesn't matter: you will find many Filipinos who are waiting for you at the exit of the terminal. They will invite you to take a seat in their van for the very reasonable price of Php500. You will probably be squeezed in it, and the driver will go at 100 kph on the roads normally limited to 50 kph. That is kind of a surprise the first time. Another solution is to book with the company Daytripper which is a little bit more expensive (Php850). It is the only company to supply an impeccable service: the driver picks you up wherever you want in Puerto Princesa, he is on time, he is careful, and seats are comfortable. There are even seat belts! There are possibilities of stop for photos, and the driver drops you off directly to your hotel in El Nido. However, Daytripper does not have a wide choice of departures per day. Last solution: there are companies such as Eulen Joy, Lexxus, or Camarih which are less renowned companies but they have the merit to be cheap (Php500), and you can book in advance by phone. NB: the international airport of Puerto Princesa opened his new terminal in May 2017, next to the domestic one. Today, Taipei is already accessible directly from there. It will be soon possible to land there directly from other cities from overseas. On arrival, these cheap van companies drop you off at the terminal of vans and coaches, situated in Corong Corong, a district of El Nido, 1 km from the town centre. For most of you, you will have then to take a tricycle for Php50 to get to your hotel. The Daytripper company drops you off wherever you want in town; please contact us directly to book with them. You don't want to waste time? The quickest (but most expensive) option to get there is to fly directly from Manila or Cebu with an European aircraft, the ATR-42. You can find AirSwift airline at terminal 4 in Manila. This company used to be called ITI until 2015. ITI was the semi-private company of the luxury hotels of the North of Palawan. Today, AirSwift is accessible by anyone. There are flights Manila - El Nido three times a day, and it is in both directions with an ATR-42 aircraft. There is also one round trip a day between El Nido and Cebu, which can turn out very convenient for the travellers who want to avoid losing time in transports. The cost of a one-way ticket is between Php6500 and Php8500 in high season, and approximately Php5700 in off season. There are from time to time special fares. Visit the Facebook account of a local shop to see if there are any available deals. The departure from Manila is at the terminal 4 since the end of 2015. The arrival is still in the small terminal of El Nido located about 10km from town. You have the possibility of going in the lounge of the SwiftAir. On the menu: mini sandwiches, petits fours, rice pudding, fruit juices, coffee, tea, etc. The WiFi is free and available in Manila, and it works! The flight lasts approximately 1 hour, it is very fast. Some tricycles wait for you on arrival. Plan Php150 to go to town. Otherwise you can walk until the exit of the airport (15 min walk along the track) and find a tricycle on the way. It will cost you Php30 per person (local price list) to go wherever you want in town. As a supplement to the first solution, you have other conveyance possibilities to go to El Nido or to explore. You will be able to experience Palawan island like a local! Take the coach instead of the van: the companies Cherry and Roro organise several trips a day, and one during the night. It takes 6 to 7 hours to get there. They often stop along the road to pick up or drop off passengers. The ticket costs between Php400 and Php450. The departure is made in San Jose. It is the bus terminal of Puerto Princesa. The arrival in El Nido is at the same place as for vans: at the bus terminal in Corong Corong. This option is ideal to share a little bit of the Filipinos life. You will meet many more local people in the coach than tourists. If your wish is to get away from westerners, then this is a nice way to do the trip. Rent a car from Puerto Princesa to have the flexibility for the number of days you plan to stay in El Nido. It is an option which is becoming more and more popular. Small cars as well as big 4WDs are available for rent, although I would avoid a 4WD as it is unnecessary and too big for El Nido town. The car allows you to get along the roads of the island of Palawan without constraint. You can stop on the way, take photos, or discuss with the local people who usually sees vans full of tourists passing by quickly. Due the recent completion of a bitumen road, trip will last 6 hours depending on your speed. Rent a motorcycle in El Nido: it costs between Php400 and Php700 for a day. Avoid renting a scooter as it is extremely dangerous due to its small wheels. Roads are dusty which make motorcycles quickly slide, so favour the 125cc semi-automatic or the 200cc manual motorcycles which are safer models. Having said that, we recommend you to drive slowly and carefully: in this region, there are no traffic rules. Everybody drives as they like so tourists should pay particular attention. Make sure to wear a helmet for safety and also it is compulsory for tourists (for now, local people are "kind of" exempt from them). Take the ferry: the ferry is available in both directions from Coron island, which is at the very North of Palawan. Coron is famous for its wild areas, and for the remains of the Japanese wrecks sunk during the Second World War. The ferry takes between 4 and 9 hours to go from Coron to El Nido. There are several trips a day covered by several companies, don't miss the right trip! They cost between Php1,000 and Php1,700. - for experienced divers wishing to explore in depth the bottoms of the Bacuit bay. The scuba diving in El Nido is exceptional and adaptable to every level of experience. The conditions are consistently good for diving, and there are multitudes of things to be seen. It's like you would have reached your destination already. Hi, my name is Tom, I am a French PADI scuba diving instructor, and a business analyst. If you are keen on learning how to scuba dive, surrounded by an incredible scenery, then give us a shout, and let's see when we can arrange a diving course, or a fun dive.